This articles discusses about various model validation techniques of a classification or logistic regression model. The below validation techniques do not restrict to logistic regression only. It can be used for other classification techniques such as decision tree, random forest, gradient boosting and other machine learning techniques. These validation techniques are considered as benchmarks for comparing predictive models in marketing analytics and credit risk modeling domain. Model validation is a crucial step of a predictive modeling project. Randomly split data into two samples: 70% = training sample, 30% = validation sample. 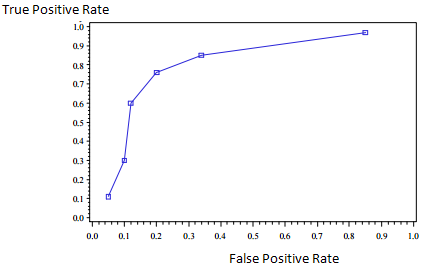 Score (predicted probability) the validation sample using the response model under consideration. Percentage of cumulative actual events in each decile. It is called Gain Score. Divide the gain score by % of data used in each portion of 10 bins. For example, in second decile, divide gain score by 20. Important Note - In this case, KS is maximum at third decile and KS score is 59.1. Ideally, it should be in first three deciles and score lies between 40 and 70. And there should not be more than 10 points (in absolute) difference between training and validation KS score. Score above 70 is susceptible and might be overfitting so rigorous validation is required. To see rank ordering, calculate the percentage of events (defaults) in each decile group and check the event rate should be monotonically decreasing. It means the model predicts the highest number of events in the first decile and then goes progressively down. You can check the rank ordering in the image below. The rank ordering is maintained in this example. 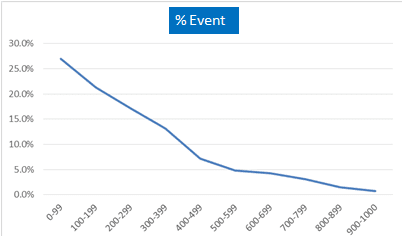 It is a simple line graph of percentage of events against deciles (scoring bins). It explains the trade-off between true positive rate (Sensitivity) and false positive rate (1-Specificity). It is calculated by summing Concordance value and (0.5 times of Tied Percent). AUC should be more than 0.7 in both the training and validation samples. Should not be a significant difference between AUC score of both these samples. If it is more than 0.8, it is considered as an excellent score. It measures calibration and shows how close the predicted probabilities are to the actual rate of events. The p-value should be greater than 0.05, it means model fits data well. This rule might be tough to achieve if you are working on large sample and small event rate. It measures how much better one can expect to do with the predictive model comparing without a model. Same significant variables should come in both the training and validation sample. KS statistics should be in top 3 deciles. Rank Ordering - There should not be any break in rank ordering. Area under Curve (AUC) - Should be more than 0.7. Goodness of Fit Tests - Model should fit the data well. Check Hosmer and Lemeshow Test and Deviance and Residual Test. 1. Jack-knife / Leave-one-out : The model is fitted on all the cases except one observation and is then tested on the set-aside case. This procedure can be repeated as many times as the number of observations in the original sample (random without replacement sampling). It is implemented in PROC LOGISTIC with predprobs=crossvalidate. If the model is tested on a single observation, it is not possible to assess one of the most important dimensions of model’s performance, i.e. calibration (measure of how close the predicted probabilities are to the actual rate of events). Randomly divide your data into ten parts. Hold aside the first tenth of the data as a validation dataset; fit a logistic model using the remaining 9/10 (the training dataset). Using the resulting training model, calculate the predicted probability for each validation observation. Repeat this 9 more times (so that each tenth of the dataset becomes the validation dataset exactly once). Now, you have a predicted probability for each observation from a model that was not based on that observation. An AUC score is calculated for each of the 10 runs, and then calculate average AUC. Rule : Compare area under curve of both the samples. The following SAS program was written by Mithat Gonen. I modified it to calculate AUC of validation dataset and store modeling results of each fold in a dataset. Note: Calculate AUC of each of the runs and then calculate average of all of the 10 runs. The bootstrap method first generates N bootstrap samples (sample with replacement) drawn from the original sample. On each of these bootstrap samples the model is estimated and the performance was measured both on the bootstrap sample and on the original sample. The average difference between the two performance measures forms an estimate of the optimism. In other words, you randomly draw your observations with replacement, then calculates the logistic regression and stores the coefficients. This is repeated n times. So you'll end up with 10'000 different regression coefficients. Rule : If a variable is truly representative of the model it will occur in the majority of the N fitted models. The c statistics is calculated for each iteration in order to examine the predicted probability of each model.The overall accuracy is the average of the N measures. The following SAS program was written by Mithat Gonen. 14 Responses to "Model Validation Techniques"
Thanks mate for all your hardwork. Ks statistics using npar1way is recorded in decimals(fragments) with p-value. How do u get 40-70? After getting the ranked probabilities, how do u know wch customer belongs to a decile? By 40-70, i meant 40% - 70% (0.4 - 0.7). Run PROC RANK with GROUPS = 10 to know the customer placement in a decile. Nice work, Deepanshu! The way you listed steps and SAS codes for model validation in logistic regression is really helpful. It would be more helpful if you have a one line statement regarding each SAS code stating what it is doing and where does it belong in the 10 steps split sample validation. is where the problem is -- SAS complains that the "Variable "p_1 is not found". The same error occurs in PROC LOGISTIC for the data=BVAL2. Really helpful post Deepanshu, I wanted to know the thoery behind calculation of KS statistic, Gini Coefficient. Also how to calculate the GOF value? But on the theoretical note, how to we score with bootstrapping logistic regression ?? where can I find the dataset of the previous SAS codes? Will you please do the same (or provide code) with the GLM model. What if we get KS statistic in 4th decile.